Have you ever heard, “To be a successful gardener, grow pumpkins” it’s an old saying. This doesn’t mean growing pumpkins are hard. In fact, growing pumpkins are very easy, comparatively growing other plants. Bury the seed and wait for the harvest as simple as it is. But you need to follow some simple instructions. Pumpkins are a creeper, so choose a good place with lots of space for their sprawling vines and where they can get at least 6 to 7 hours of direct sunlight everyday. 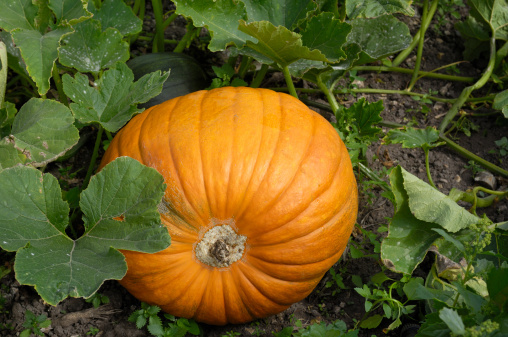 Pumpkins are very sensitive for cold weathers as they are warm season vegetables. So before planting pumpkin, make sure the soil is frost free. Choose a well-drained, fertile, loamy soil with neutral pH. Pumpkins do well when the seeds are directly planted into the ground. Allow the soil to get thoroughly warmed before you plant, so let the frosts pass. If you are planning to plant pumpkins for Halloween, then they are best to plant in the end of the May month to early July. Once you are ready with the location, sow the best pumpkin seeds directly into the ground with 1 – 2 inches deep and water them. Germination will take place within 7 to 10 days after planting the seeds when the temperature is about 60 degree F.
Within a week period you can see the seedlings growing with their set of true leaves. Pumpkins are very thirsty plants and they need lots of water to survive. Water them deeply and make sure the soil is moisture. Do not allow the water to sit, this will end up killing the plant. As long as you water them properly the plant will grow and look healthy. Water near the stem do not allow the water to sit on the leaves, as it will bring the fungal disease. The best temperature for growing pumpkins are 75-85 degree F in the daytime and 60-70 degree F at the night time. Pumpkins are heavy feeders so feed them with organic nutrients. Pumpkins grow vigorous and aggressively covering lots of area. To develop a strong support system for the best growth of pumpkin you need to do proper pruning. Train the vines to grow in the direction you intend to grow it. Pruning will not only allow to grow in a proper direction, but also will encourage the plant to devote its energy towards the pumpkin fruit. After 10 week’s pumpkin will start flowering, in the blooming stage pumpkin requires lots of water and nutrients. Pumpkin flowers are big and blooms in a golden yellow color. These flower blooms only for one day and then they die. A pumpkin plant grows male and female flowers. Make flowers sits on long thin stems where female flower sits closer to the vine. Pumpkins appear when the flower falls off. Once the pumpkins grow bigger, leave them on the plant as long as possible. To harvest the pumpkin check the skin if it is hard and the color of the fruit changes into deep shades of setting sun and also if the fruit starts to crack near the stem, harvest them. Cut each pumpkin from the stem, leaving several inches of the stem attached. Store your pumpkins in a warm, dry and airy place and save pumpkin seeds for next year. Pumpkins can be made into sweet or savory dishes, their seeds are healthy and fun to roast. Enjoy your Halloween, growing lot bigger pumpkins.